System Health provides insight into the well-being of the Kafka cluster from both a broker and topic-centric perspective. The two sections share many common features with each other, which will be outlined below. System Health is accessible by selecting the item labeled “System Health” from the main navigation. Request latency percentiles are only available in the brokers section of System Health. Each chart displays a similarly styled tooltip when hovering. These tooltips can display multiple metrics at the same time which are each paired with an icon. The icon will either be a (good) check mark or a (bad) X symbol at each point. Similar to the chart tooltips, many of the table metrics will visually change to indiciate potential issues via a red underline. Hovering the mouse over text with a red underline will display an explanatory tooltip. Total number of brokers in the cluster currently online and with Confluent Metrics Reporter enabled. If the broker count is less than the number of brokers in your cluster and you have under replicated topic partitions, then investigate the brokers that are missing from the broker table. Review the broker logs for WARN or ERROR messages. At least one broker has disconnected from ZooKeeper in the last interval. If this is “Yes”, check network connectivity and latency between brokers and ZooKeeper, and verify ZooKeeper is running. Adjust the broker configuration parameter zookeeper.session.timeout.ms if needed. During steady state there should be only one active controller per cluster. If this is greater than 1 for only one minute, then it probably means the active controller switched from one broker to another. If this persists for more than one minute, troubleshoot the cluster for “split brain”. Average network pool capacity usage across all brokers, i.e. the fraction of time the network processor threads are not idle. If network pool usage is above 70%, investigate the production request latency and fetch request latency metrics to isolate where brokers are spending the most time. Consider increasing the broker configuration parameter num.network.threads. Average request handler capacity usage across all brokers, i.e. the fraction of time the request handler threads are not idle. If request pool usage is above 70%, investigate the production request latency and fetch request latency metrics to isolate where brokers are spending the most time. Consider increasing the broker configuration parameter num.io.threads. Disk usage distribution across all brokers in a cluster. Disk usage is determined to be skewed if the relative mean absolute difference of all broker sizes exceeds 10% and the difference between any two brokers is at least 1GB. If disk usage is skewed, consider rebalancing the cluster using the ref: Confluent Auto Data Balancer <rebalancer> . Total number of topic partitions in the cluster that are online, i.e. on running brokers. If the number of topic partitions online is less than the number of topic partitions in your cluster, investigate topic metrics shown in the Topics tab. If the number of under replicated topic partitions is greater than 0, investigate topic metrics shown in the Topics tab and investigate the broker that is missing topic partitions. Review the broker logs for WARN or ERROR messages. If the number of offline topic partitions is greater than 0, investigate topic metrics shown in the Topics tab and investigate the broker that is missing topic partitions. Review the broker logs for WARN or ERROR messages. When clients write data to Kafka, they send produce requests to leader brokers which handle the produce requests and send responses back to the client. When clients read data from Kafka, they send fetch requests to leader brokers which handle the fetch requests and send responses back to the client. It is important to monitor the throughput and latency of these produce and fetch requests to ensure your cluster is performing optimally. On each of the broker and topic tabs of the System Health view, you will see a summary of the produce and fetch requests, as shown below. The left side shows the produced metrics, and the right side shows the fetched metrics. In either the Brokers and Topics tab, you can hover the mouse cursor over an individual row of the broker or topic table to overlay the request statistics for that individual broker or topic in the chart. Total number of bytes per second of data produced to or fetched from this cluster. Total number of successful requests produced to or fetched from the cluster in a one minute interval. Total number of failed requests produced to or fetched from the cluster in a one minute interval. 2. 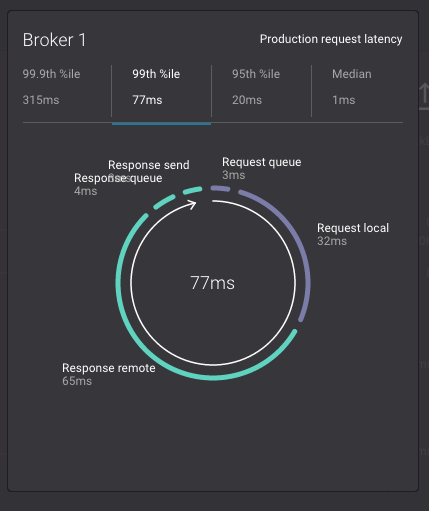 Click on the line graph in the “Request latency” chart to see a breakdown of produce and fetch latencies through the entire request lifecycle. The request latency values can be shown at the median, 95th, 99th, or 99.9th percentile. Total time of an entire request lifecycle, from the broker point of view. If total request latency starts high or steadily increases over time, drill down into the other the request latency metrics to isolate where brokers are spending the most time. The time the request is in the request queue waiting for an IO thread. A high value can indicate several things. There may not be not enough IO threads so consider increasing the broker configuration parameter num.io.threads. The CPU is a bottleneck so monitor broker CPU. The time the request is being processed locally by the leader. A high value can imply slow disk so monitor broker disk IO. The time the request is waiting on other brokers. A high value can imply a slow network connection so monitor network connectivity. A high value can also imply there is not enough data to give in a fetch response. This can happen under normal scenarios when the consumer is caught up to the end of the log and there is no new incoming data, in which case the response remote time will be close to fetch.max.wait.ms. The time the request is in the response queue waiting for a network thread. A high value can imply there are not enough network threads so consider increasing the broker configuration parameter num.network.threads. The time the request is being sent back to the consumer. A high value can imply the CPU or network is a bottleneck so monitor CPU and network utilization. Total number of topics in the cluster. If the number of topics is less than expected, verify that clients are producing to or consuming from the topics that are missing. If the number of in sync replicas is less than the number of replicas in your cluster, identify the topic with out of sync replicas from the topic table and “view details” of the topic to determine which brokers are out of sync. Investigate the broker logs to determine cause. Total number of topic partition replicas in the cluster that are out of sync with the leader. If the number of out of sync replicas is greater than 0, identify the topic with out of sync replicas from the topic table and “view details” to determine which brokers are out of sync. Investigate the broker logs to determine cause. Count – Number of log segments for this topic across all partition leaders.